Client wanted to build an easy to use job posting system, where an oddjobber can gain exposure to numerous people with short jobs in their area matching the skills. Client wanted to build an enclosed community local to the people living in a neighborhood aimed at improving the way people source projects in their local area. Client had a raw idea which we nurtured, matured and developed. Functionality evolved around the basic architecture of the application. The project specifications were revised and revisited based on the targeted audience. The main challenge of the application was to keep users connected with each other and have trust amongst the niche community without having an online payment system involved. Our user experience team and analysis team worked hand in hand to be able to document requirements and create Proof of concepts (POC) for the application. The application designs included branding of the application, wireframe structuring of the project and then the prototyping. We setup up a dedicated team managed by our project managers and account managers who ensured and enabled a quality product delivery. Creating a seamless user experience with a web design that was highly user friendly, and optimizes the website to make it SEO friendly. We used third party integration for analytics, SMS Gateways and many more. Application was built using MVC and Code Ignitor frameworks. The main & the only system for generating revenue from the website was the bidding process which was quite challenging to build as it had a different payment process flow local to the neighborhood. Project used Facebook API connections for registration and verification on the website. 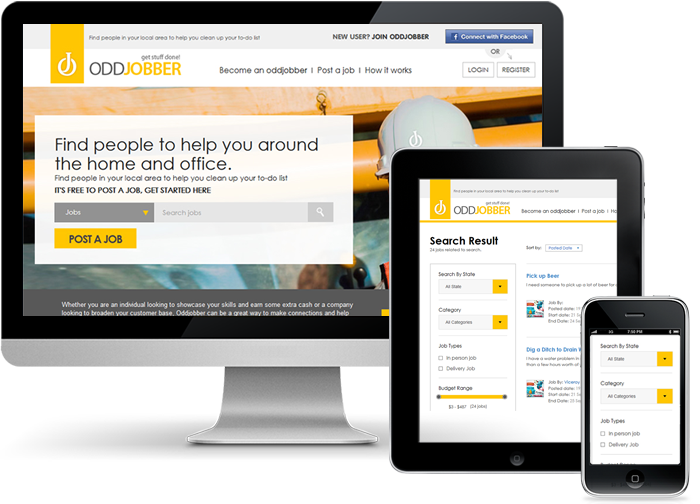 Odd Jobbers has become a quick and easy way for everyday jobs posted by people to get jobs done that they didn’t have the experience or skills to complete. It has also given job seekers a way to earn some quick money while waiting to get a long term job or just a way to earn some extra spending money. The client has been very happy with the way the site turned out and how the UI / UE enable the everyday user to use the site. The site continues to grow adding new features to it on a continuous basis.